Berlin Philharmonic concerts to be screened in 3D at UK cinemas | What Hi-Fi? If you missed the Berlin Philharmonic performing in London in February, you'll get another chance to see the orchestra in action in UK cinemas next month. And the really novel thing is that the performances will be broadcast in 3D. 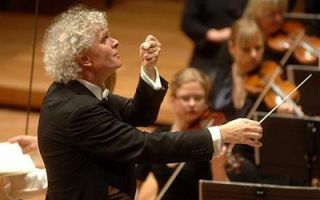 Conductor Sir Simon Rattle hopes to reach new audiences by screening 3D concerts in hundreds of cinemas across the world, including 140 in Britain. The idea is to give cinemagoers the sensation of sitting in the front rows and also among the orchestra, offering close-ups of the virtuoso players. The first film features a performance of Mahler's First Symphony and Rachmaninov's Symphonic Dances, recorded in Singapore. Cineworld and Empire are among the UK cinema chains that will show the Berlin Philharmonic concert on May 9th.